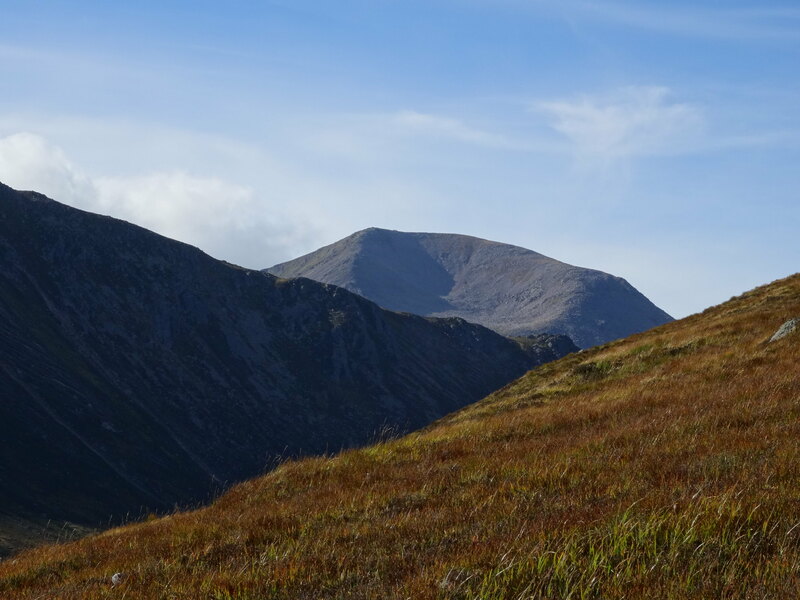 Our last Munro's of 2016- such a perfect day. 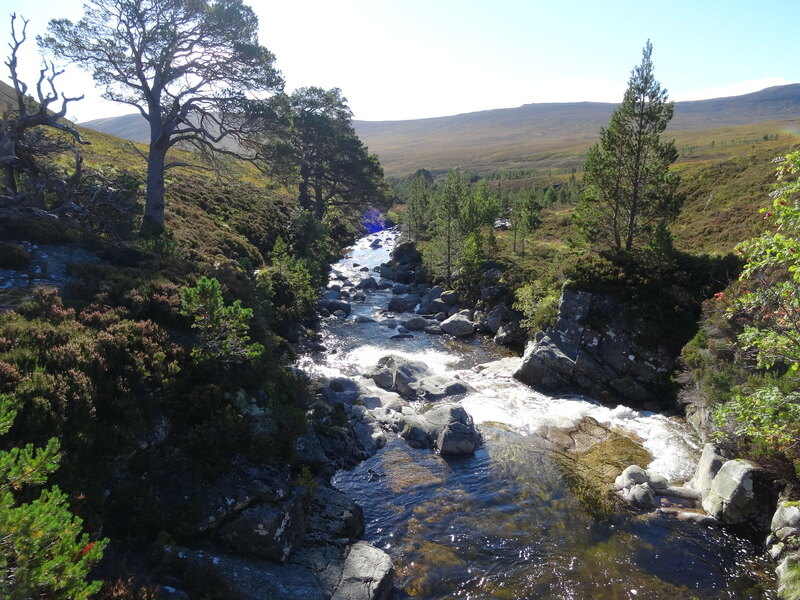 Linn of Dee is only 2 mls away. 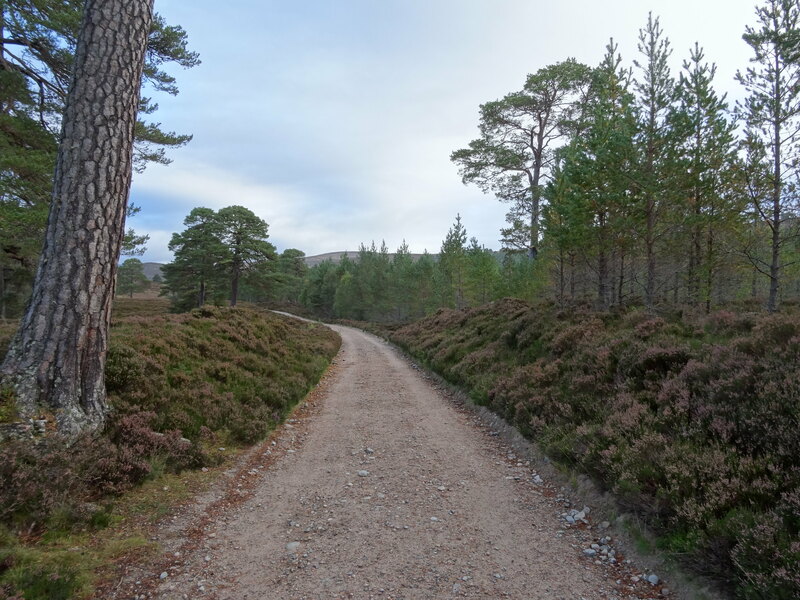 This is another walk where a bike would be a good investment as the initial track to Derry Lodge is ideal for bikes and would knock a good couple of hours in total off this walk. 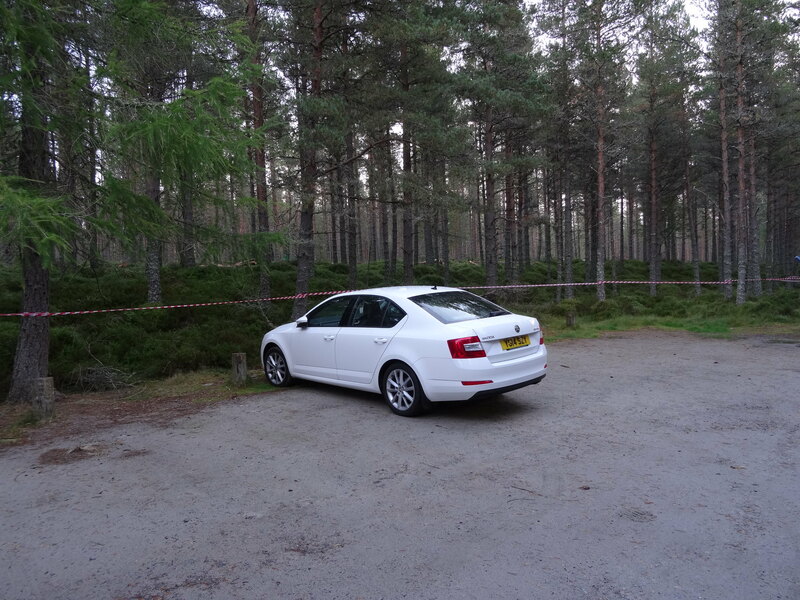 We were early, the car park was empty apart from the odd campervan, we paid the £2 carpark fee got ready and were off in good time. 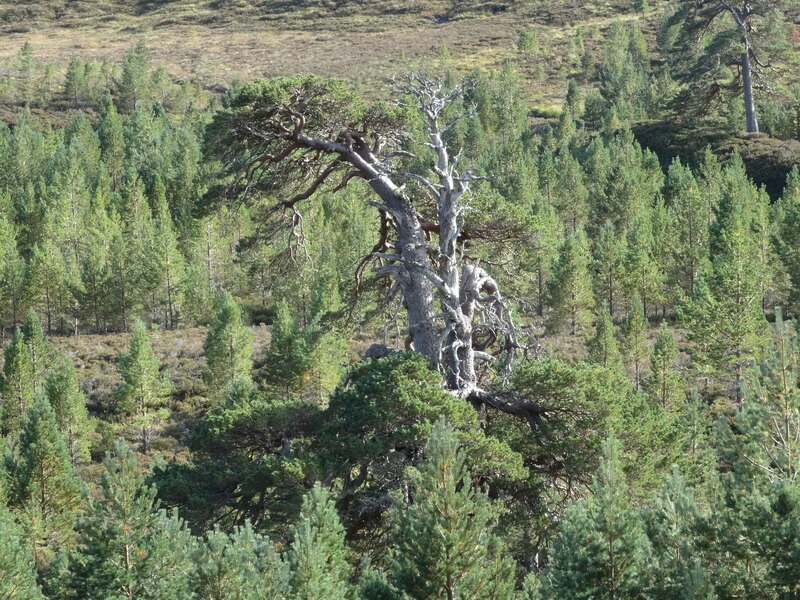 There was some tree felling going on in the forest near the carpark, I was watching the machinary felling and trimming the branches off the trunks in one go, really efficient and speedy, I bet they could clear a decent patch of forest in a day. 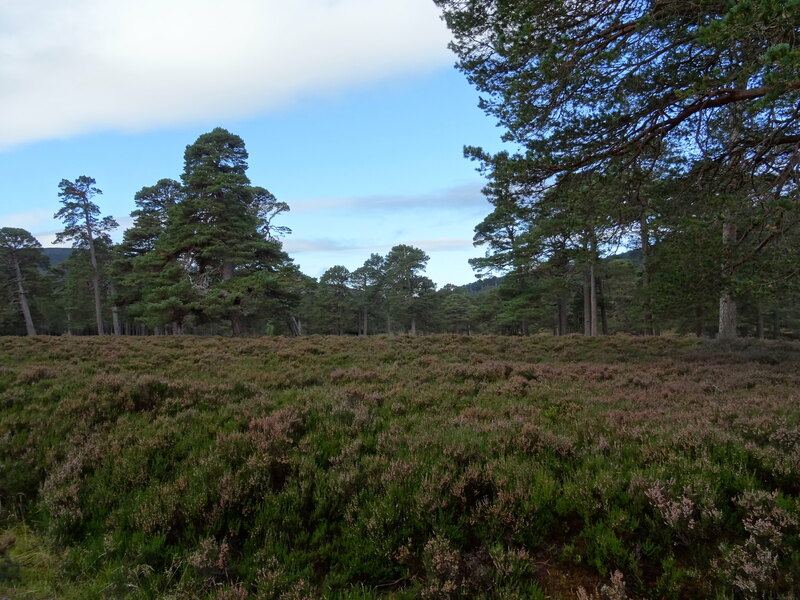 We soon got clear of the trees and once over the Lui Water and on the good track towards Derry Lodge we upped the pace and the distance was soon covered. 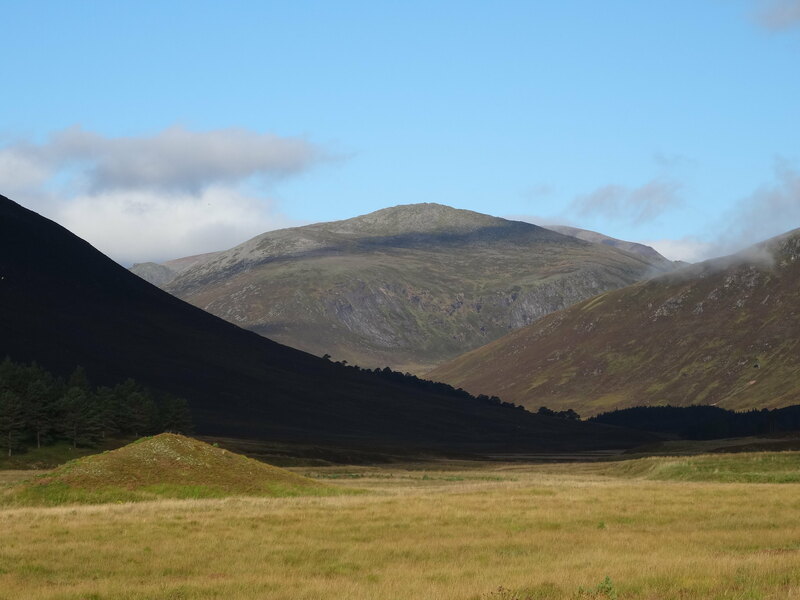 The weather was good, just a bit cooler than recent days but the sun was out and the mountains were clear of any early mist. Derry lodge looks a magnificent building I would imagine it was pretty impressive in its day. Over the bridge turn left and continue over soggy terrain for a short while then its back to a good solid path again. 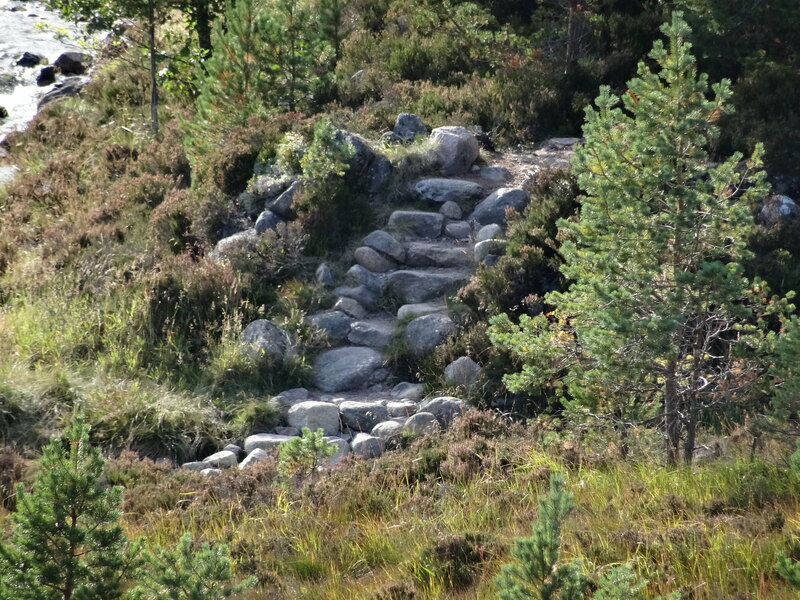 Good path all the way. 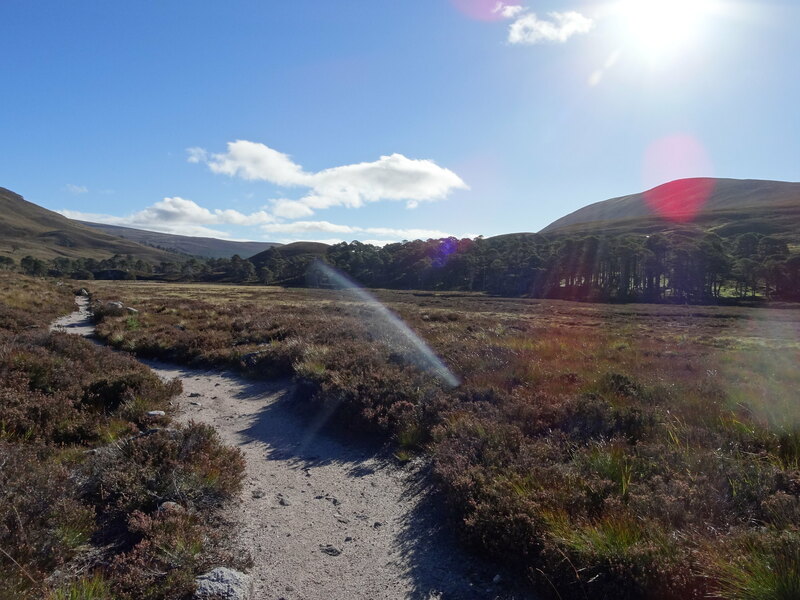 Its like this all the way to the ford over the Luibeg Burn. The other side of the ford. We didn't cross it here, we were softies and went for the footbridge a little higher up the burn just to make sure our feet stayed dry. 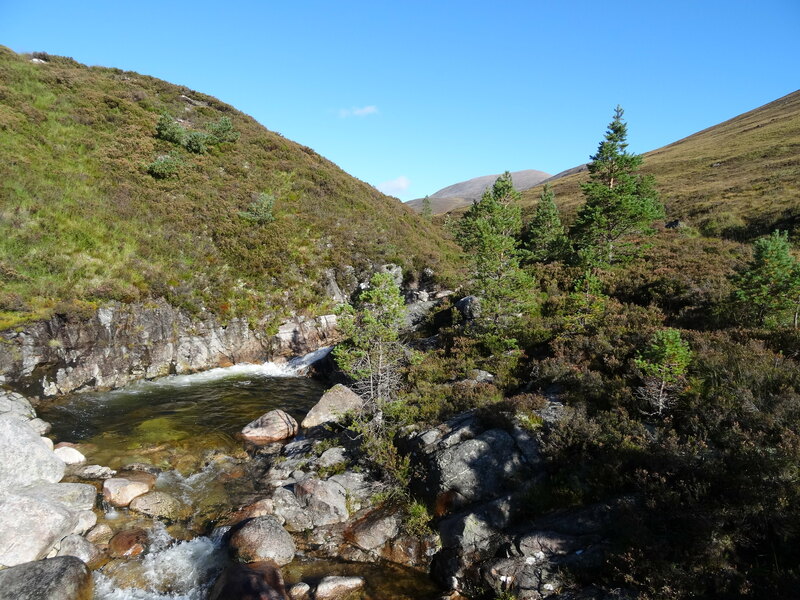 The Luibeg Burn from the bridge. Over the bridge and back on the track we were soon at the point where the good path up Carn a'Mhaim starts, This is a good path and great to walk on, height is gained steadily with very little effort. 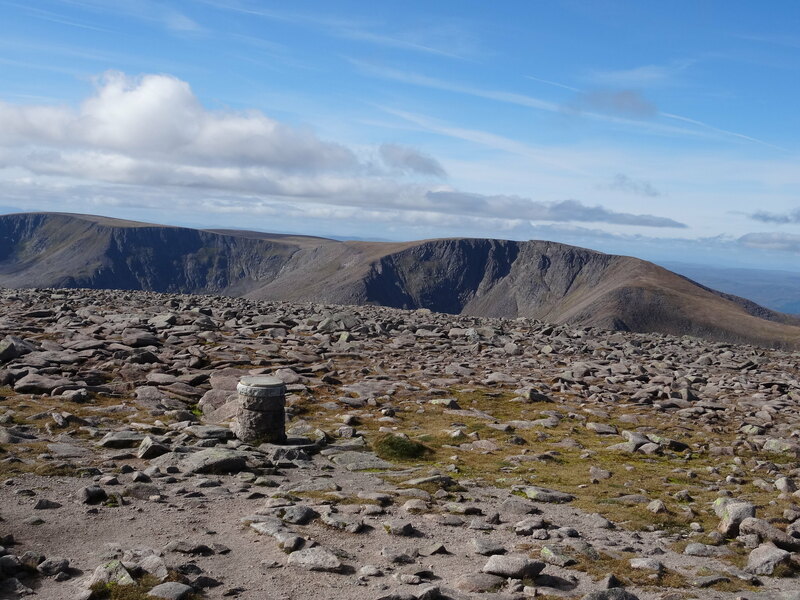 Part of Derry Cairngorm. 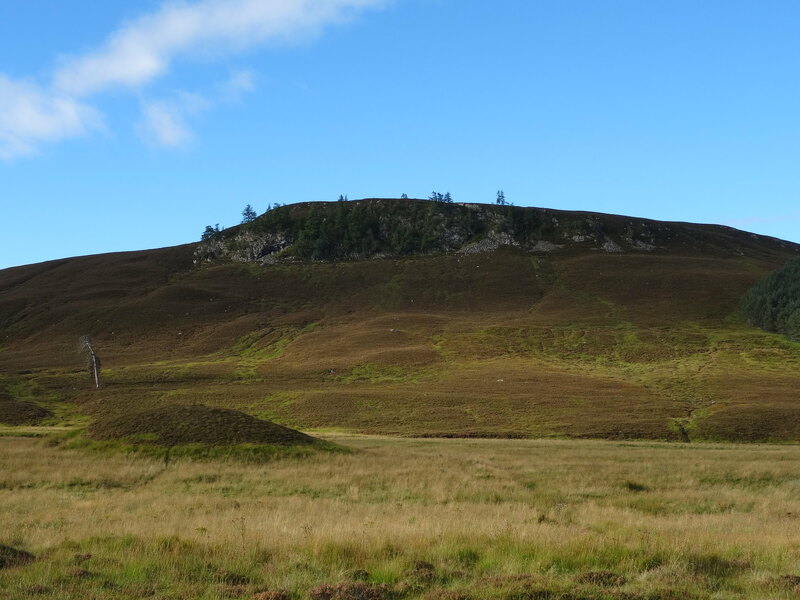 Carn Crom to the right? 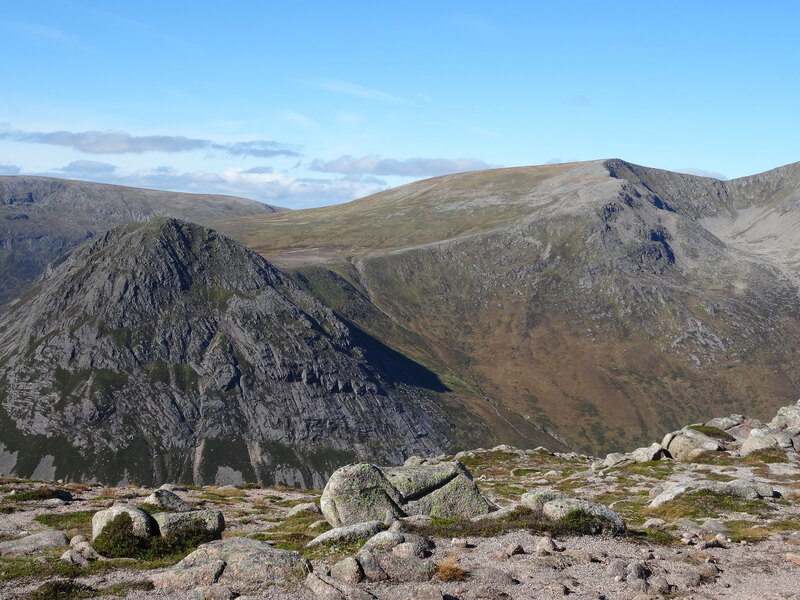 Once over the steep bit it becomes gradual again and the views get better and better, the Devils Point and Carn Toul come into view, that view is spectacular and well worth the effort. 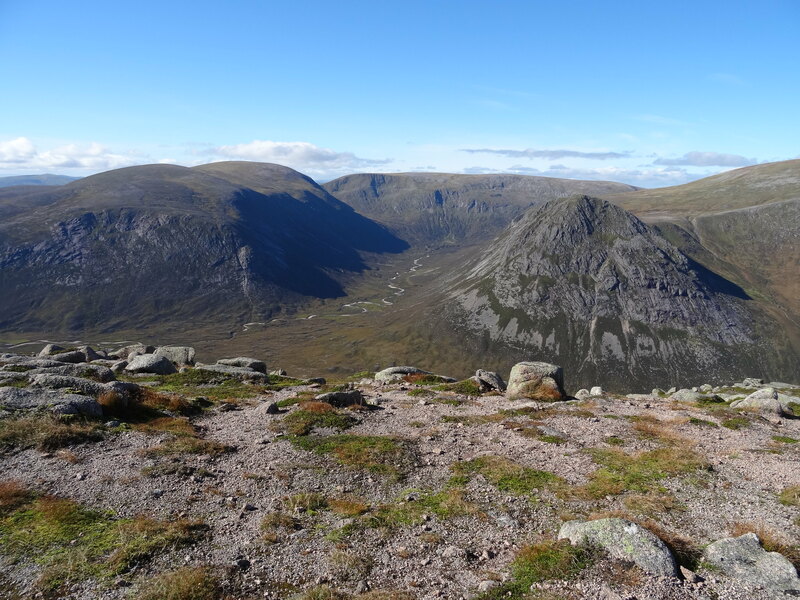 Beinn Bhrotain and Devils Point. 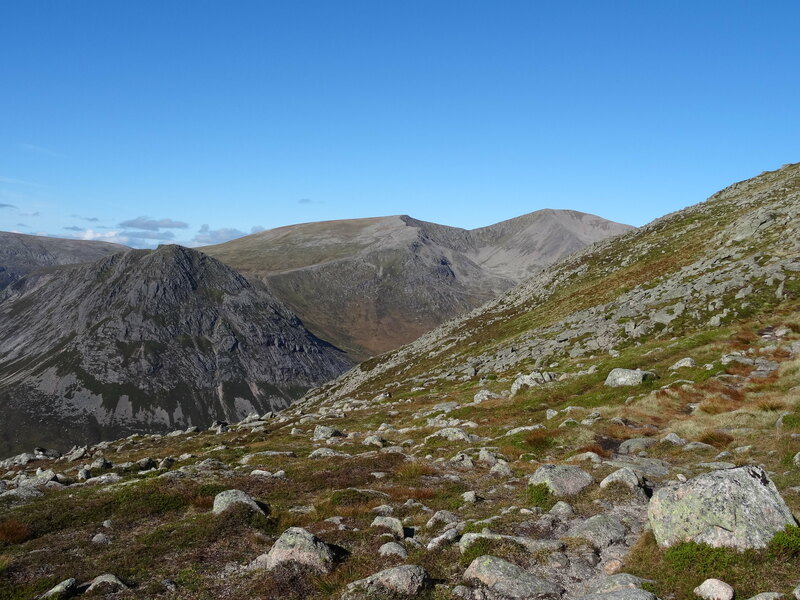 Devils Point, Stob Coire an t-Saighdeir and Cairn Toul appearing. 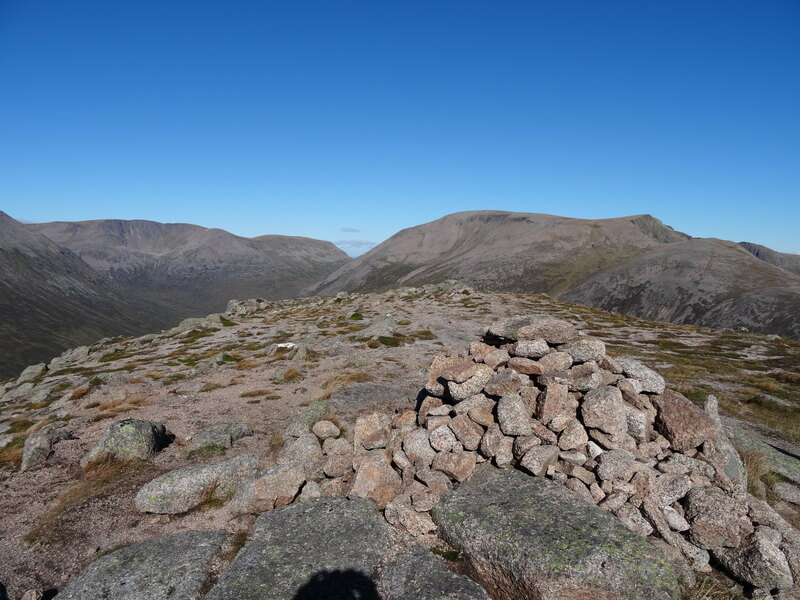 We carried on and soon got to the summit and what views, absolutly mind blowing, its a fantastic summit to be on. 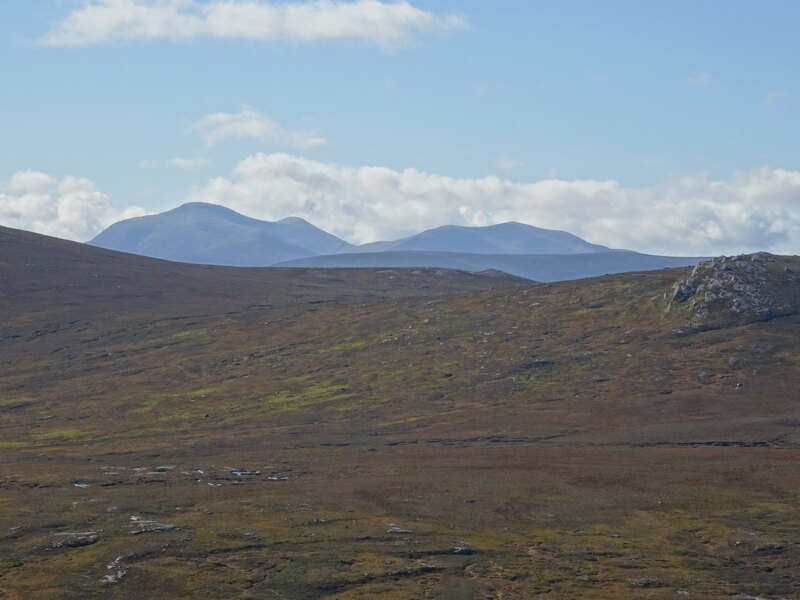 The really dominant mountain around is Ben Macdui and it looked too close to ignore. 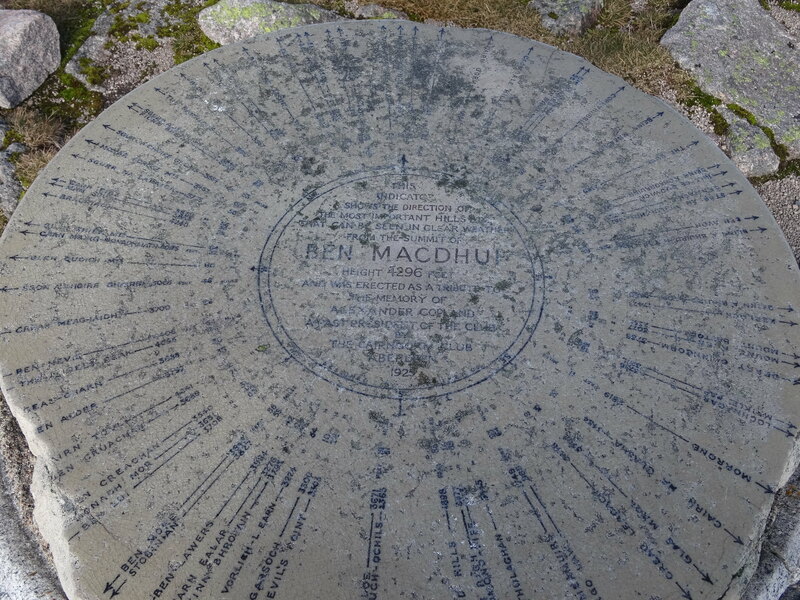 I had had plans to include Macdui if the weather was half decent and Denise was well up for it, I was having second thoughts on the way up but actually seeing what was involved to get there it looked just fine so the decision was made to go for it. 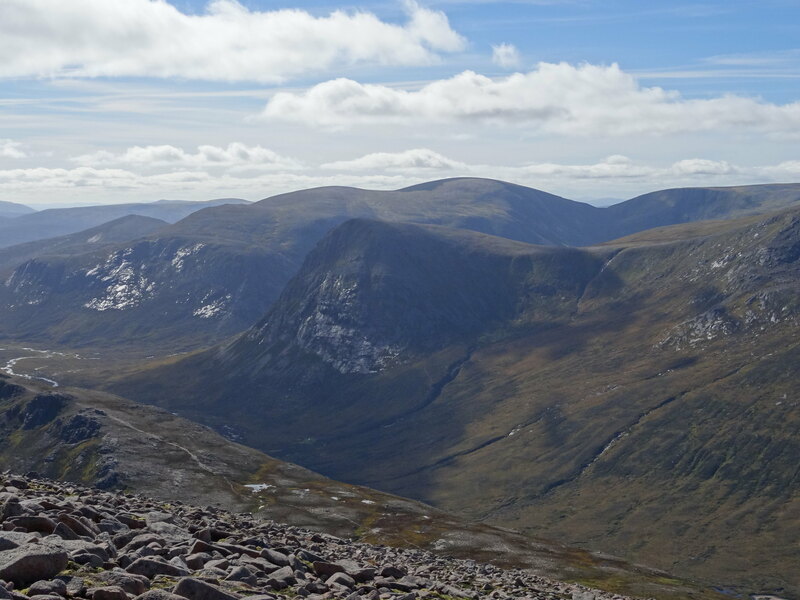 Braeriach left, Ben Macdui to the right. 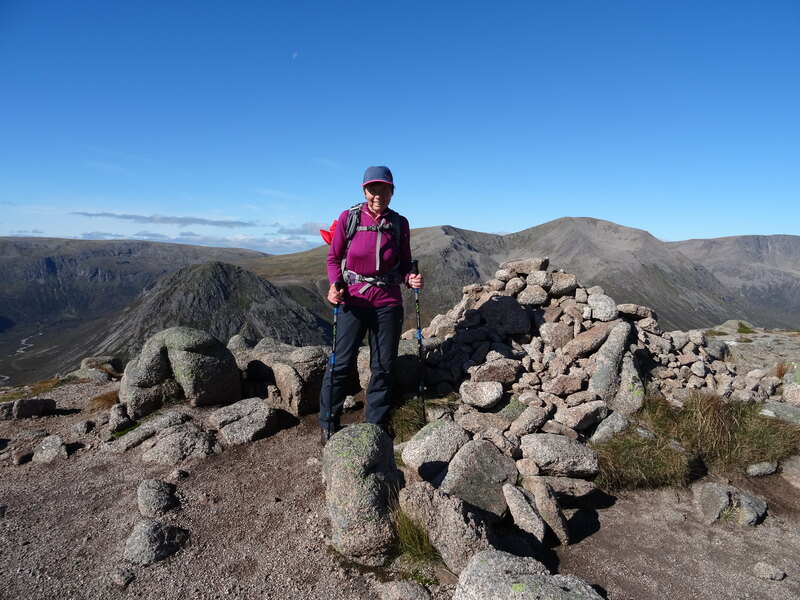 After our summit piccy's and a snack it was off down the ridge heading NNW, this ridge is great, all the way down you get views of Devils Point, Cairn Toul, Sgor an Lochain Uaine, Braeriach and Macdhi, massive mountains dressed in huge crags and corries, absolutly stunning. 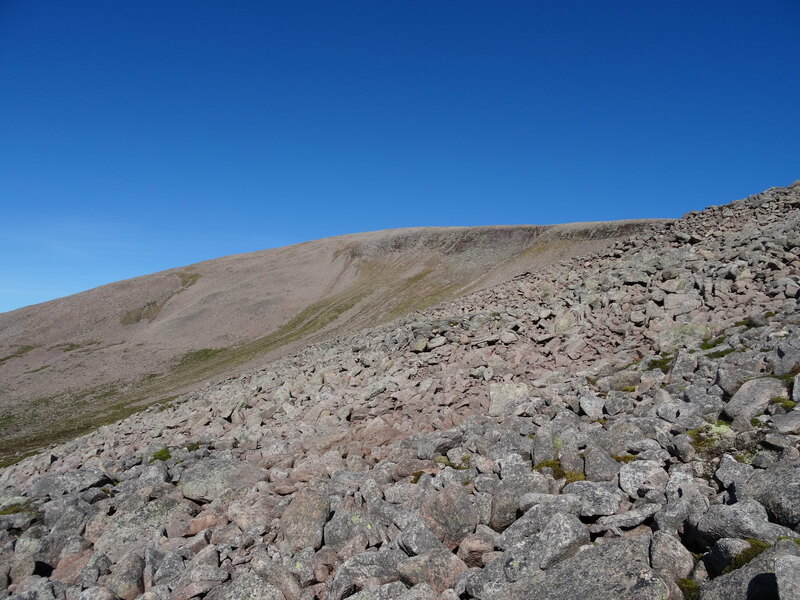 In the bealach the path continues and heads up the slopes, about two thirds of the way up the boulder field starts and the path becomes very sketchy at best, higher up it disappears so we used the boulders as a staircase and headed towards the bealach at 1249m, got there and spotted the path heading to the summit of Ben Macdui. 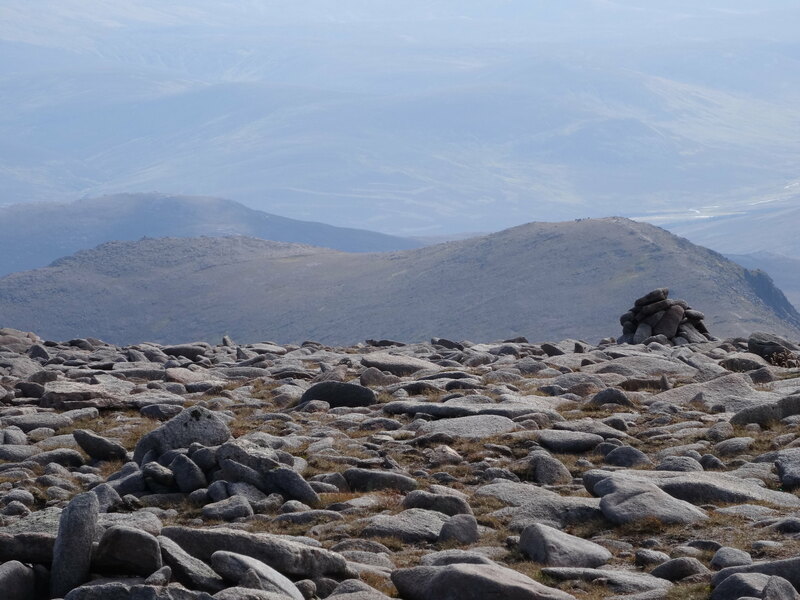 The walk over the boulders on the platau is fairly straight forward on a day like today, in the mist or in a whiteout I bet it could be a bit unnerving, its a big empty space. 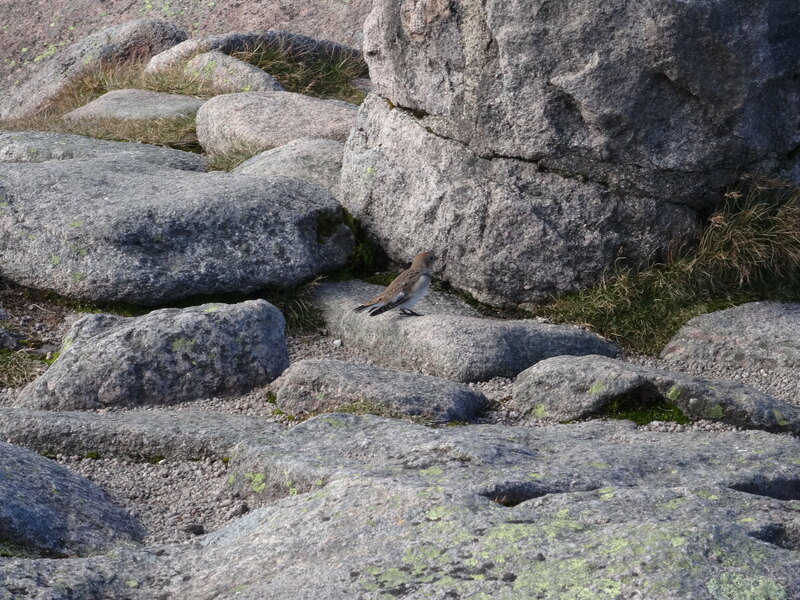 There were quite a few people on the summit, up to that point we'd not seen a soul so we'd chosen the quieter side. 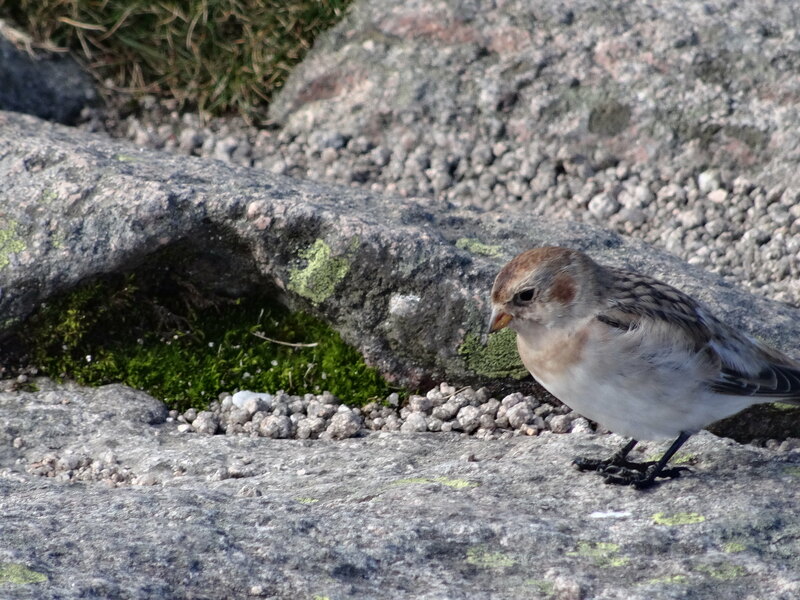 I'm not very good at bird I.d so apologies if I'm wrong. 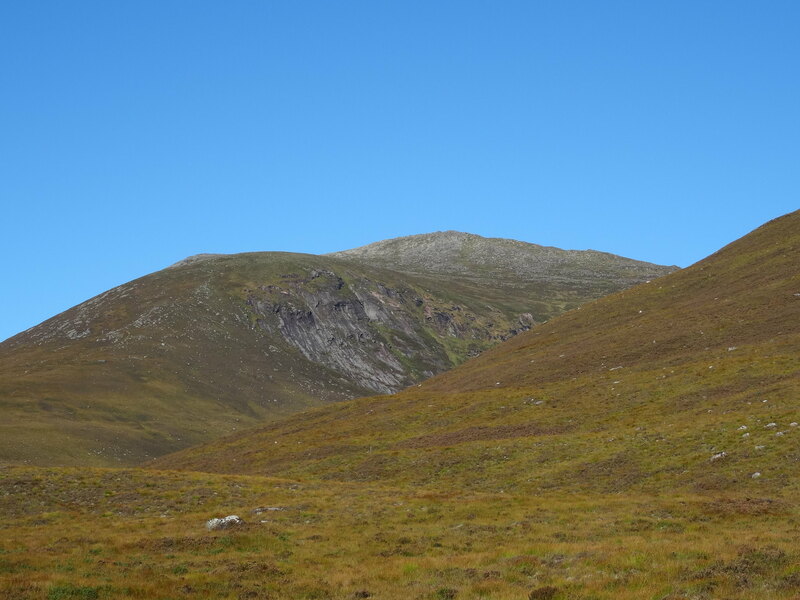 The Barns of Beinn Mheadhoin. 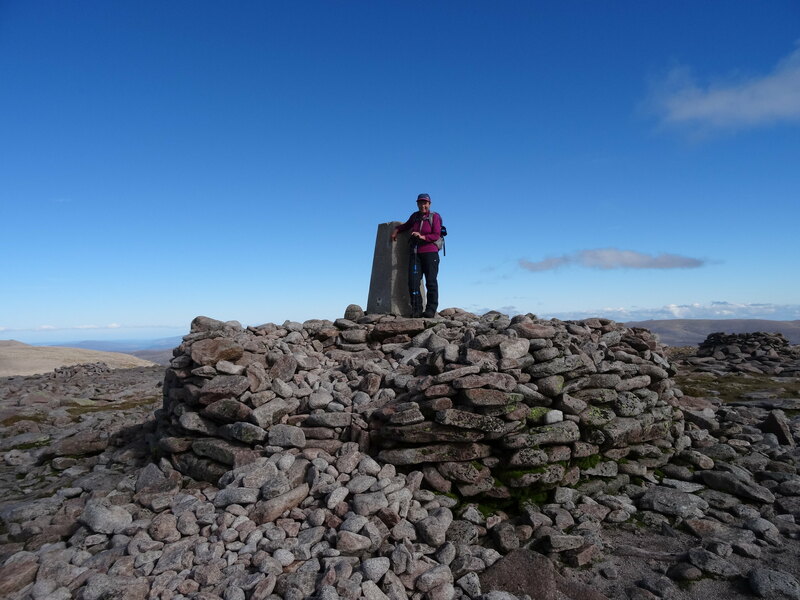 I'm really glad we decided to include Ben Macdui on this walk, it's one I've wanted to do for a while but never thought of an approach from the south so, again, Walkhighlands planted the seed and peoples reports suggested how to do it, so thanks again to all. 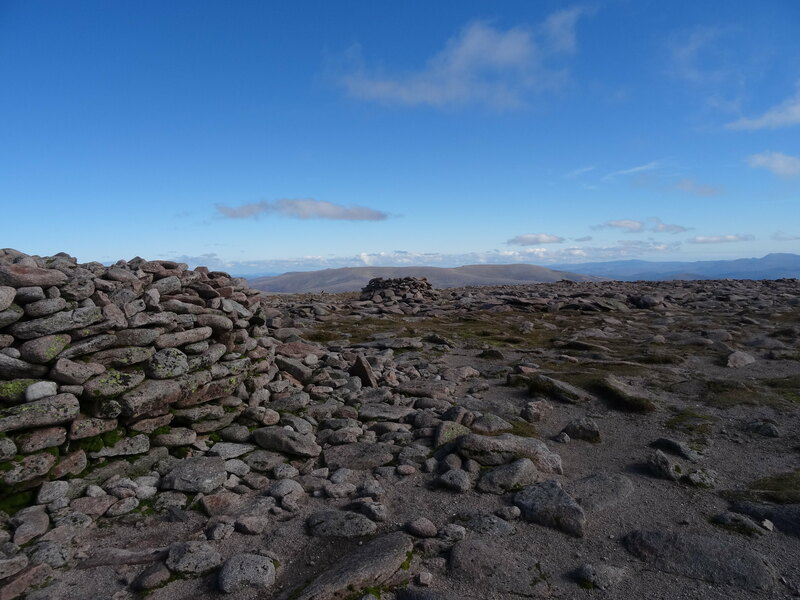 The descent from Ben Macdui was via Sron Riach and once back at the 1249m bealach a path can be made out heading towards it. 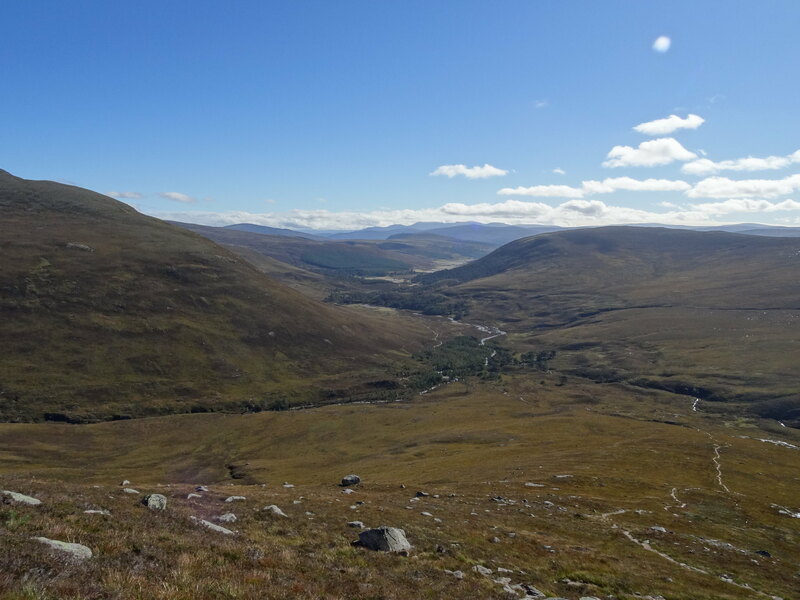 From the bealach there's a descent of around 130m over boulders to Sron Riach but there's a path of sorts so progress is reasonably easy and once over Sron Riach the path improves and becomes better and it's good all the way back to the main track that takes you back to Derry Lodge. 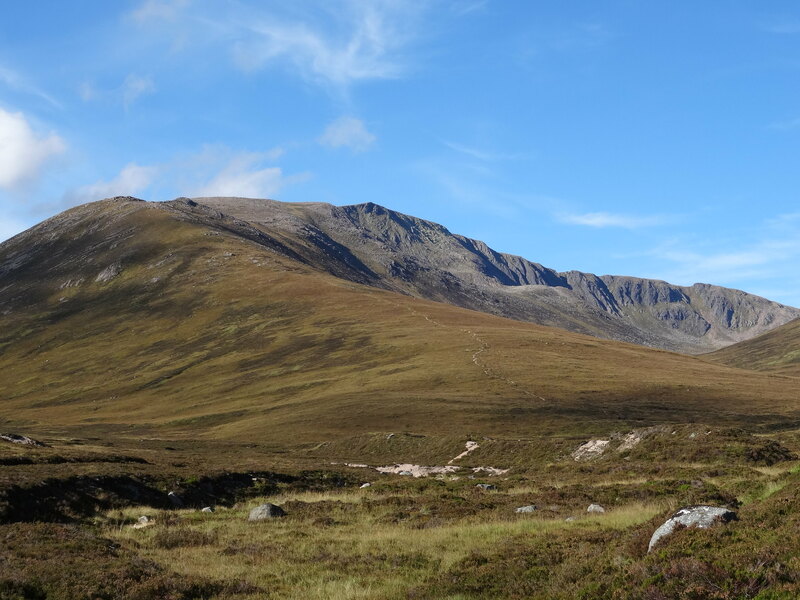 Looking back from Sron Riach. More views from on the way down. Back at the lodge we stopped for a rest and something to eat and reflected on a great day out. 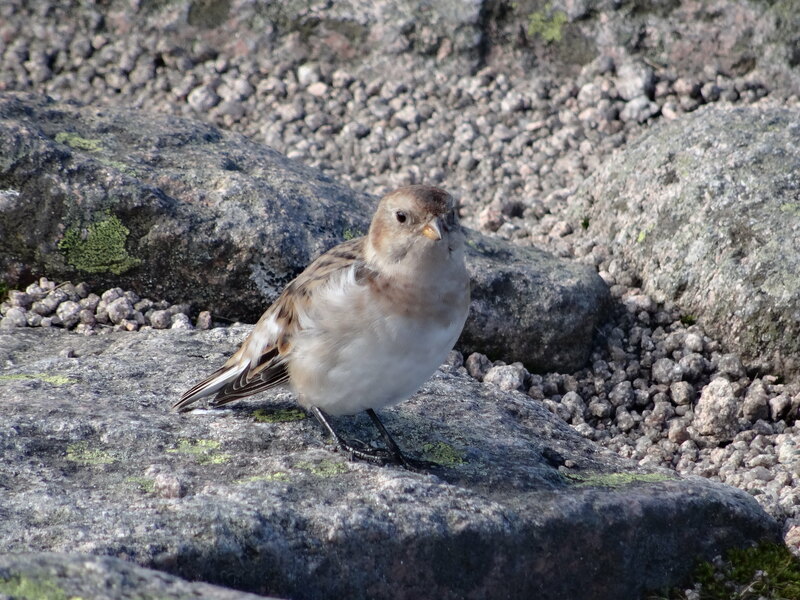 Ben Macdui was our last Munro for 2016, no more holidays but these two were great to finish the year on. 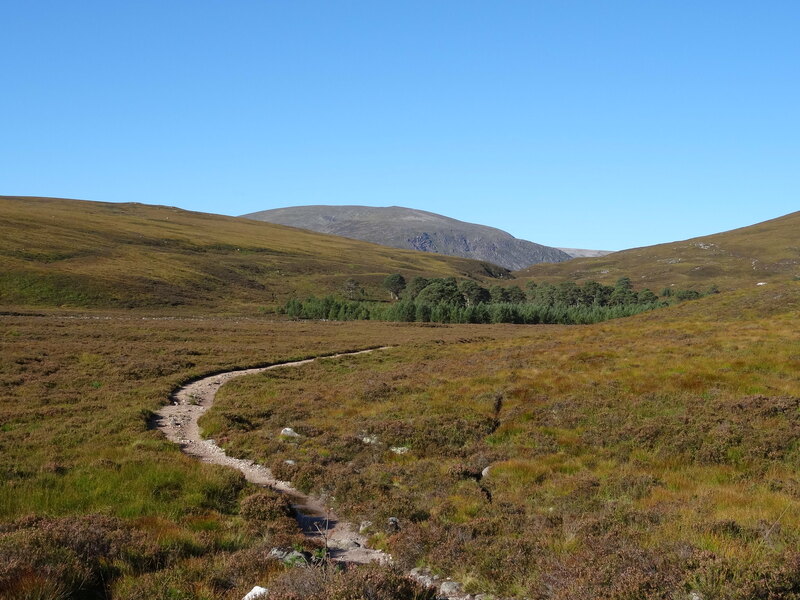 From the lodge it was a march back to the Linn of Dee, but that was pretty easy even on tired legs and it rounded off a good and fairly demanding day. 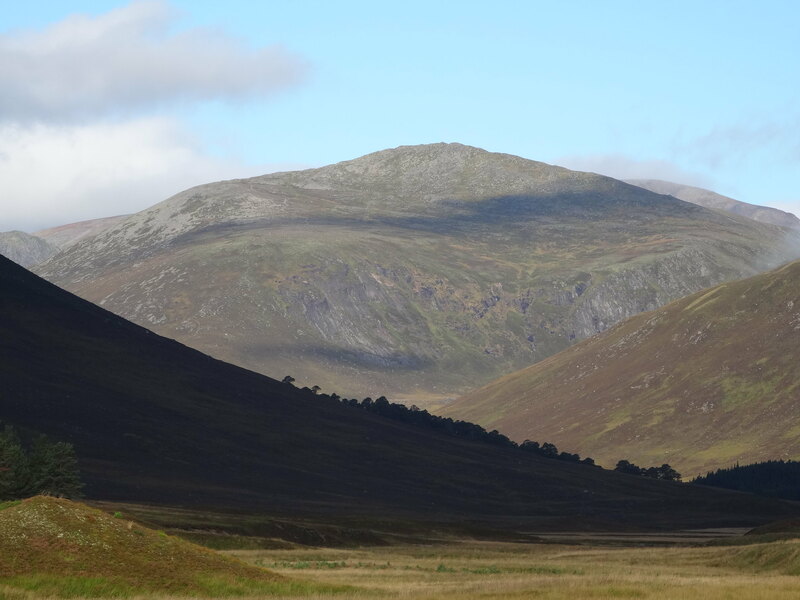 The Cairngorms are brilliant.......we've still a lot do do. 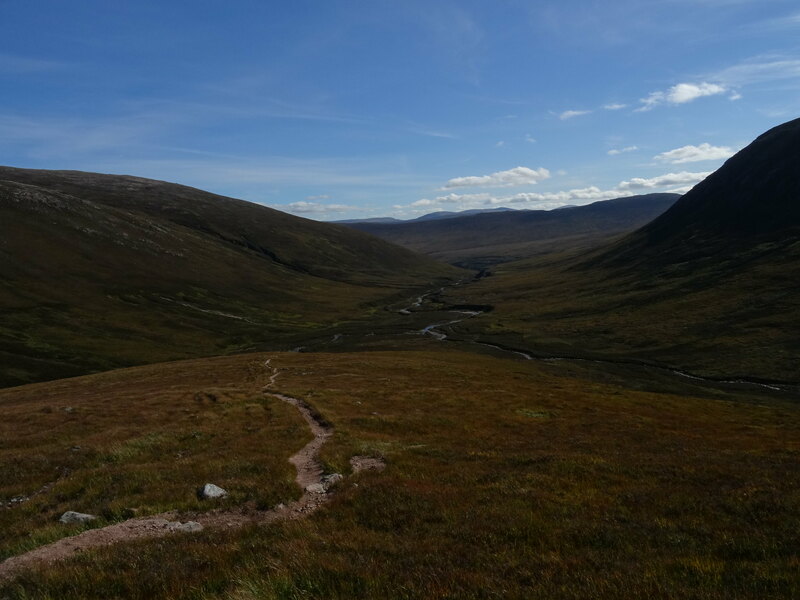 Re: Our last Munro's of 2016- such a perfect day. What a brilliant day you had for it! 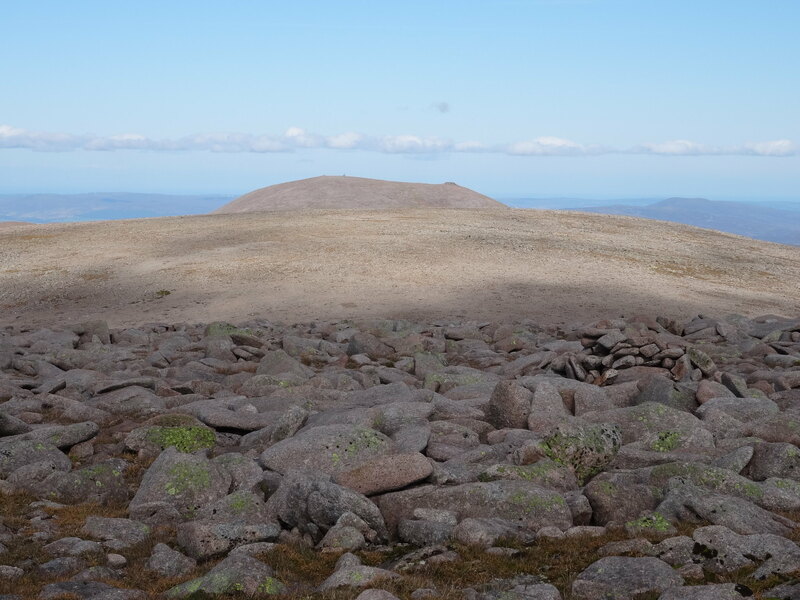 You got all the views from BM that I'd hoped for when I did it a few weeks ago, but didn't get (due to clag). 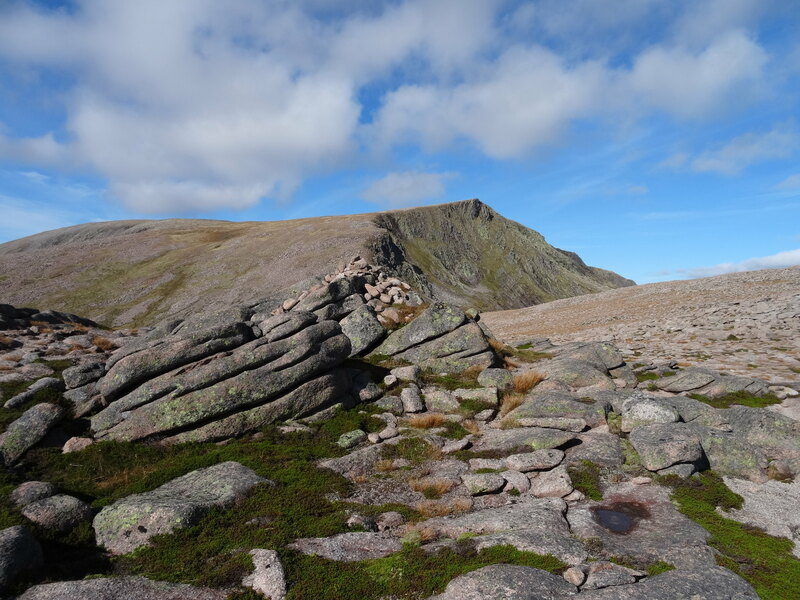 And you've really captured a lot of the essence of the Braeriach ridge in many of the pics - great stuff! And - a wonderful thing - it seems you had no beastie problems!! Great pictures there martin. Looks like a cracking day too. 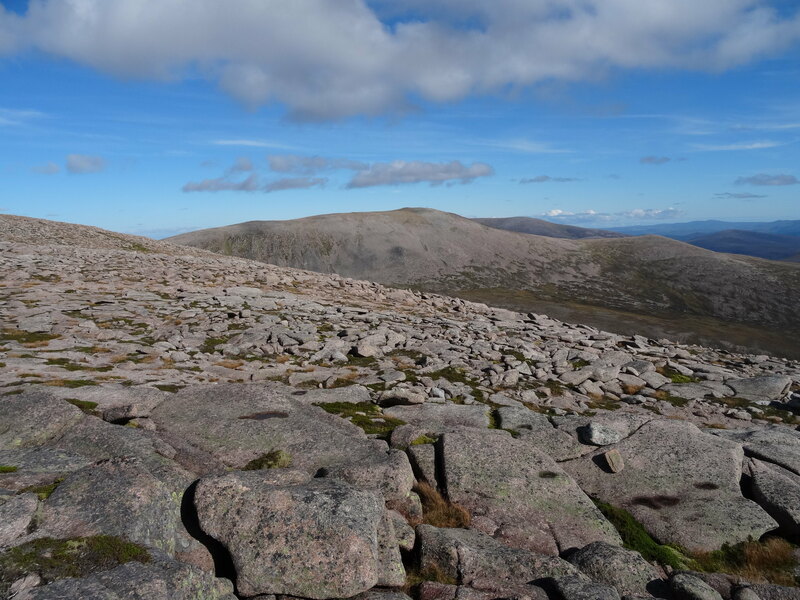 A couple of months ago I walked from Linn of Dee to Aviemore station and went over Carn a Mhaim summit. 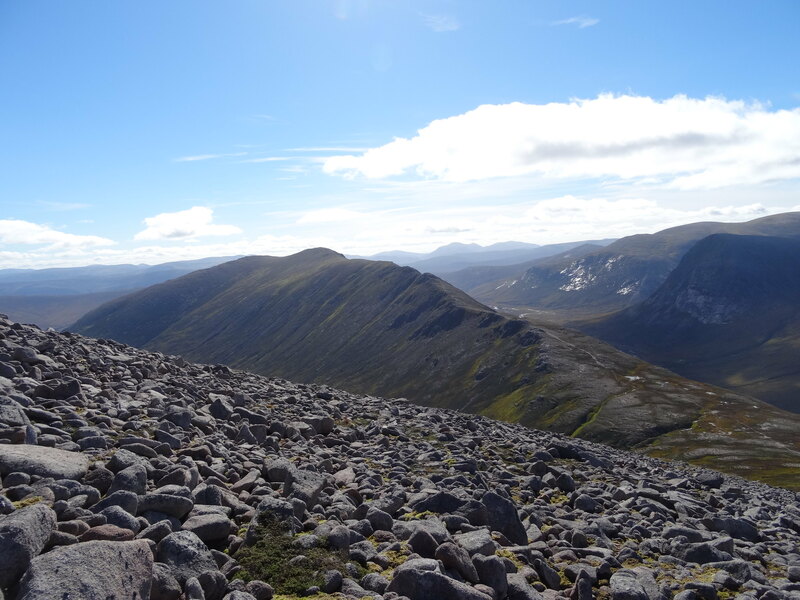 I cut down on to the Lairig Ghru path after the ridge. 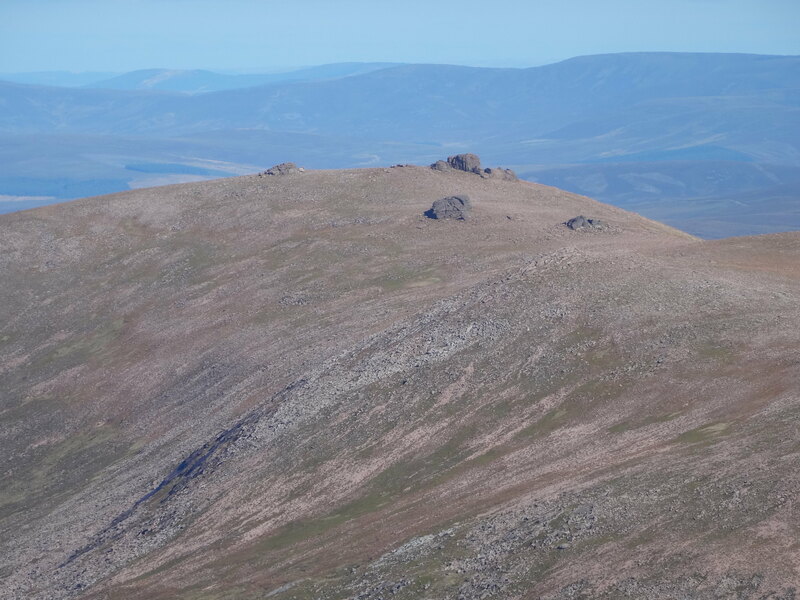 Your walk looks to be about the same length but with a fair bit of extra ascent up to MacDui. 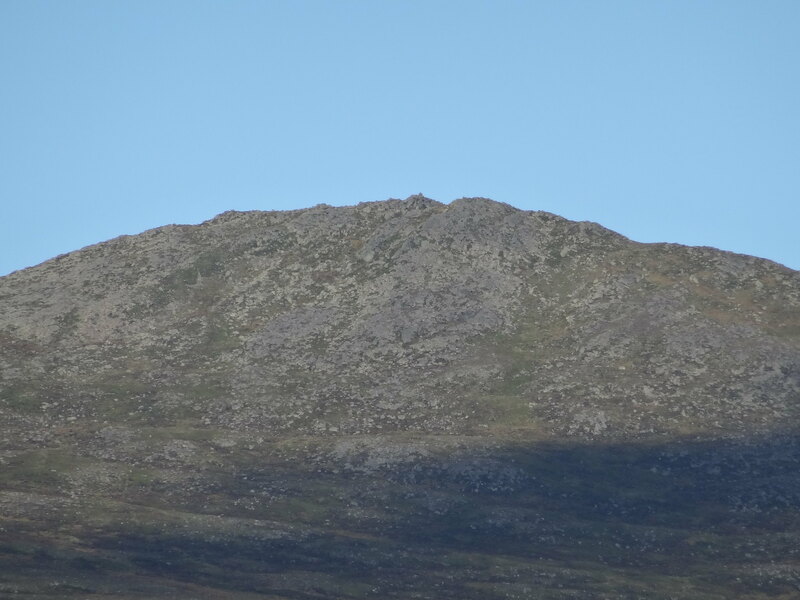 I didn't get the blue sky pictures that you got unfortunately. Alteknacker wrote: What a brilliant day you had for it! 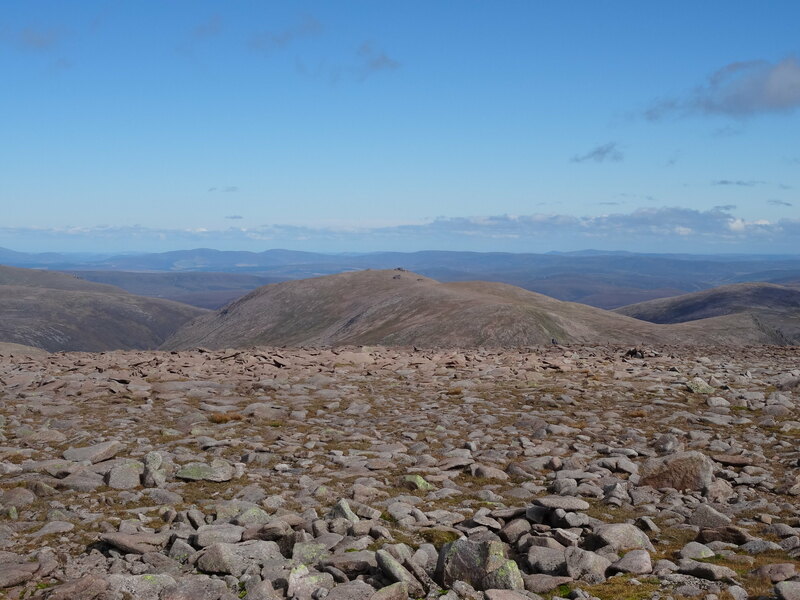 You got all the views from BM that I'd hoped for when I did it a few weeks ago, but didn't get (due to clag). 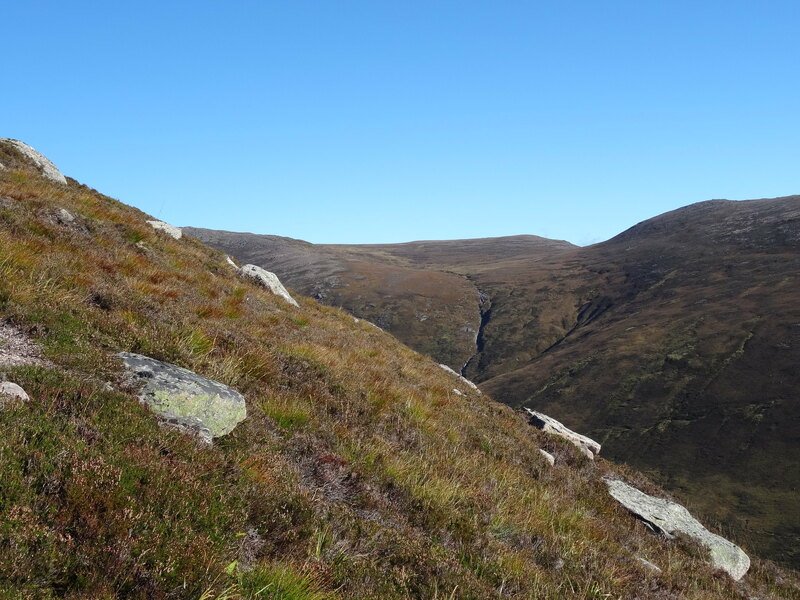 And you've really captured a lot of the essence of the Braeriach ridge in many of the pics - great stuff! 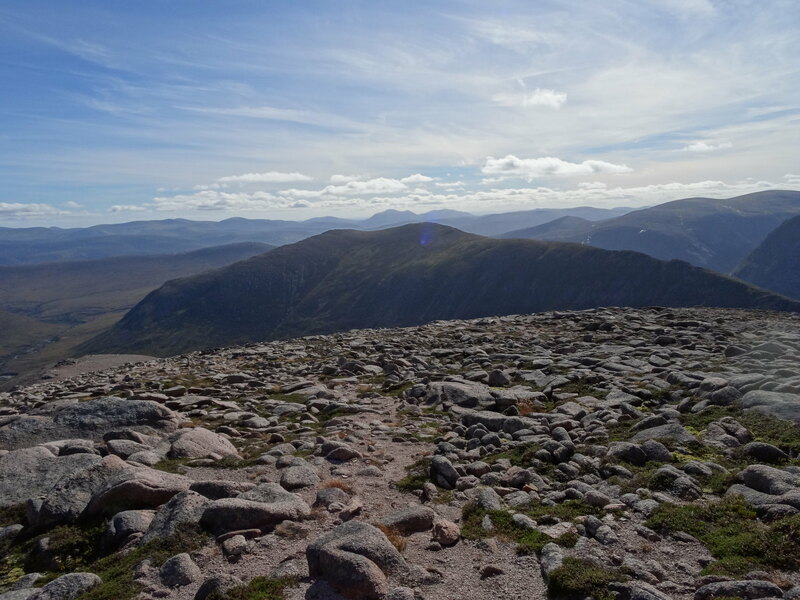 Hi Alteknacker, We've not been in that part of the Cairngorms before and I was stunned by the epic views, I've always thought of them as being a bit lacking in spectacular, not now that we've seen what they're all about, can't wait for a return visit. Hi Martin, yes I did read your report, it was one of those that planted the seed. 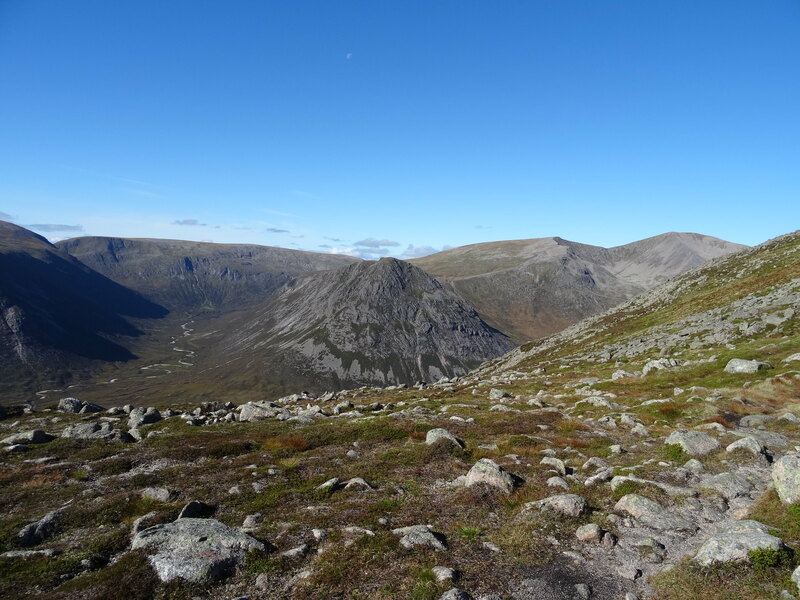 We were thinking of including Derry Cairngorm but thought against it, I feared we might run out of daylight as we didn't leave Macdui untill turned 14:30 and wasn't sure how long it would take to get back to Derry Lodge. Sunset tripper wrote: Great pictures there martin. Looks like a cracking day too. 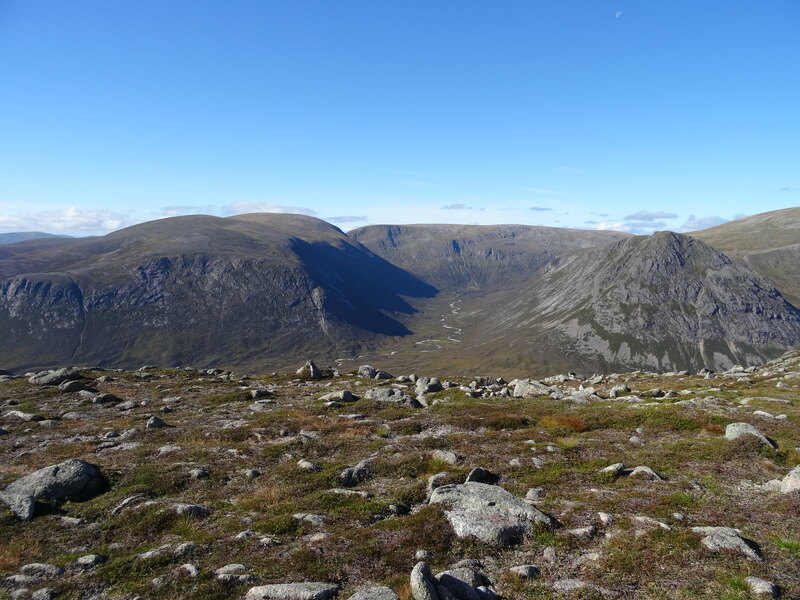 A couple of months ago I walked from Linn of Dee to Aviemore station and went over Carn a Mhaim summit. 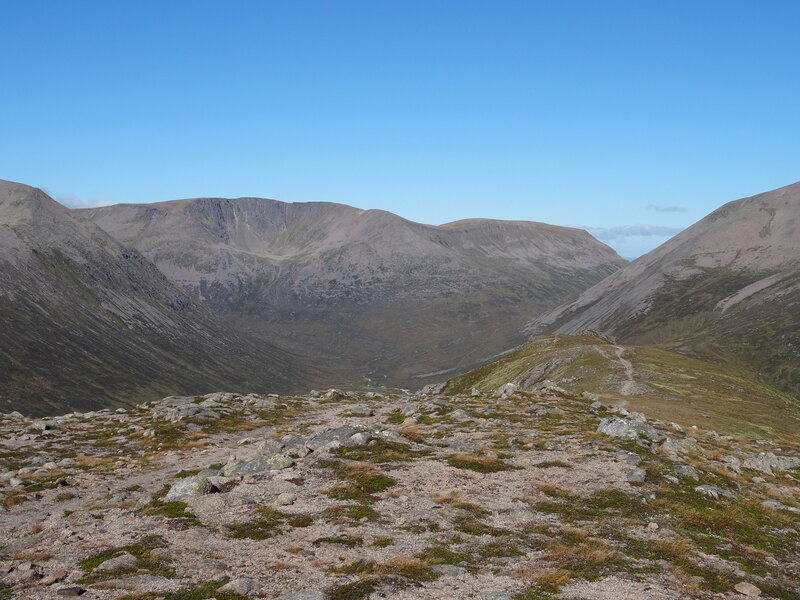 I cut down on to the Lairig Ghru path after the ridge. 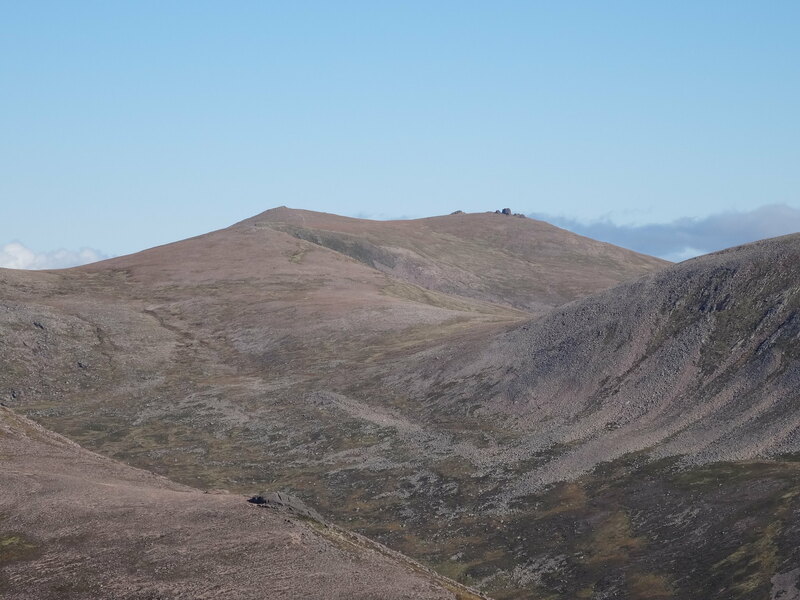 Your walk looks to be about the same length but with a fair bit of extra ascent up to MacDui. I didn't get the blue sky pictures that you got unfortunately. 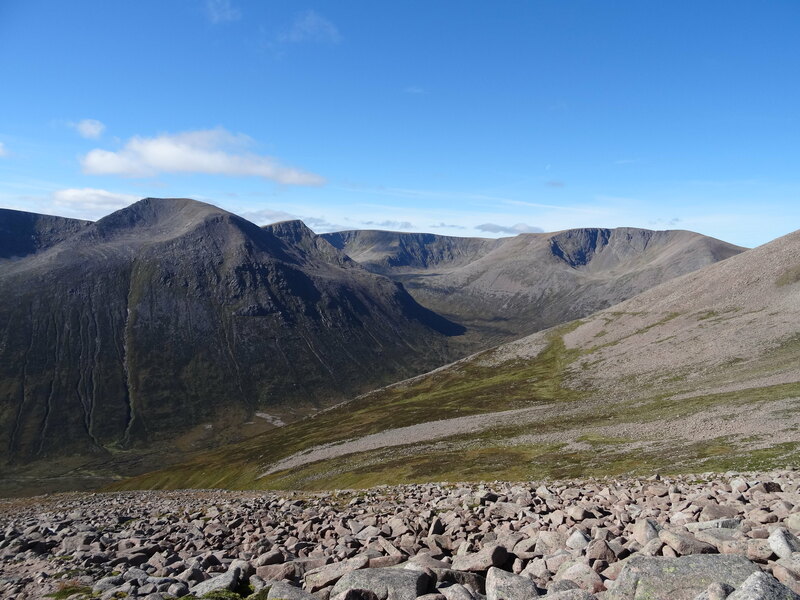 I'm thinking of a trip from Linn of Dee over Devils point, Angels Peak, Cairn Toul and Braeriach returning to Linn of Dee via Lairig Ghru and Glen Lui next June, not sure if it'll be possible in the day but might be worth having a go if we can get similar weather with plenty of daylight. 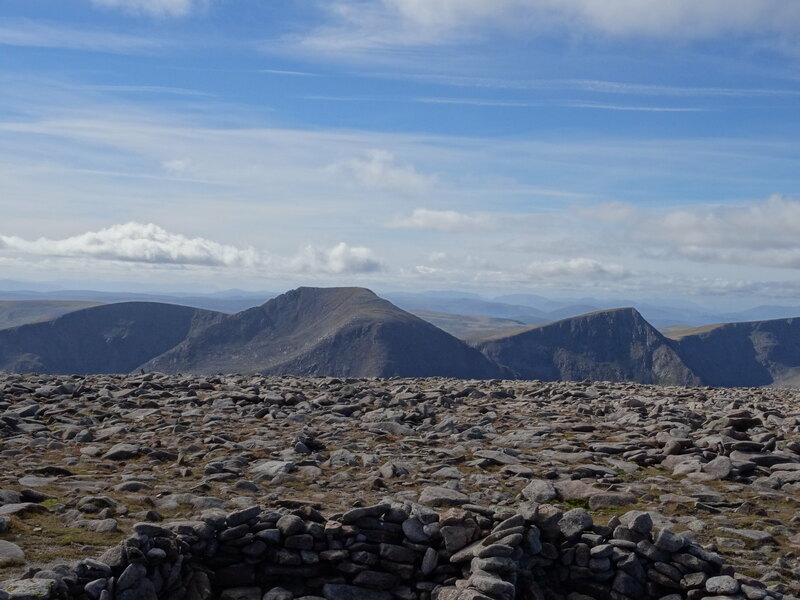 Fantastic weather, views and pictures -a great balance of blue sky and sparing cloud.